Duel Breaker Plates For Continuous, Un-Interrputed Filtration. Operating Temperatures: Standard - 400 F. High Temperature - 625 F.
Standard RJC Items: PolyExtractors, 1 Extra Filter Assembly, Spare Cartridge Heaters. Throughput (Lbs/hr) 130 to 1600. KG 60 to 750. Extruder Size Range: 1.5" to 5"
Polymer : PE, HDPE, PP, PS, PE, PS, ABS, Nylon. Special: PVC (flexible) and PC. Fig 2 - Time For A Screen Change (Left Side)Without Shutting Down The Line. Close Valve n.1 and n. 2. Withdraw Filter Assembly and replace filter pack and insert; tighten bolts. with polymer and the polymer will exit the purge valve. Close Purge Valve and Open Valve n.2. 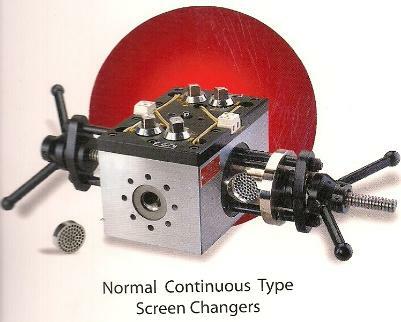 Replace manual and silde-plate screenchangers with the non-leak and stable pressure profile. 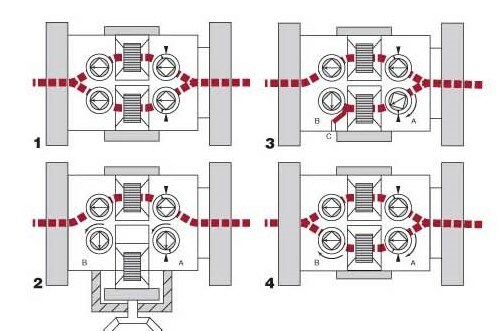 May eliminate the need for melt pumps to control pressure variations.